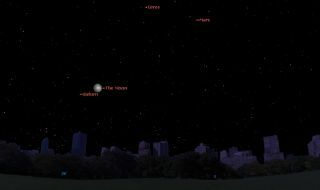 This sky map shows the location of Saturn and the moon at 9 p.m. on Tuesday, May 13, 2014, as seen from mid-northern latitudes. The locations of planet Mars and Ceres, the largest asteroid in the asteroid belt, are also shown. On Tuesday evening (May 13), as the moon, just one night from full phase rises in the east-southeast sky it will be accompanied by a very bright yellowish-white "star" shining off to its lower left. That "star" will be the planet Saturn. Saturn is currently shining bright in the night sky, just a few days after reaching opposition — its best display for stargazers — on Saturday (May 10). The planet shines at brilliant magnitude of zero on the brightness scale, making it virtually equal to the bright star Arcturus visible high above Saturn. So despite its relative close proximity to the moon, Saturn will still manage to stand-out quite well. And what will be especially interesting will be to watch how the moon seems to approach Saturn during the course of the overnight hours. At dusk on Tuesday, Saturn will appear about 5.5 degrees to the lower left of the moon. (Your closed fist held out at arm's length covers about 10 degrees of the night sky). The moon will move toward Saturn at its own apparent width (one-half degree) per hour during the night. So by dawn on Wednesday (May 14), the Saturn and the moon will be low in the west-southwest, the moon having moved to within 2.5 degrees to the lower right of the ringed planet. More interestingly, from the southern half of Australia, New Zealand and Victoria Land (Antarctica), the moon will occult (hide) Saturn on Wednesday evening. On May 10, Saturn reached opposition, rising in the east-southeast at dusk and arriving at its highest point in the middle of the night as a bright spectacle in the southern sky. Saturn set in the west-southwest at dawn. Saturn's famous rings appear much more impressive than in recent years, since they are now tipped by 21.5 degrees from edge on with their northern face in view. A telescope magnifying at least 30-power will be needed to bring them into view. The rings are continuing to open toward a maximum of almost 27 degrees in 2017. Editor's Note: If you take an amazing photo of Saturn, or any other night sky view, that you'd like to share for a possible story or image gallery, please contact managing editor Tariq Malik at spacephotos@space.com.